Voodoo Tactical Mojo Load-Out Bag with Backpack Straps FREE SHIPPING! 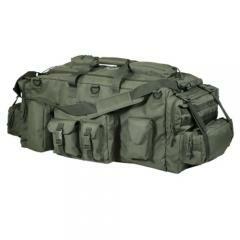 Store all the gear needed for an extended trip with the Mojo Load-Out Bag from Voodoo Tactical. With a monstrous main storage compartment, pockets galore and ultra-durable construction, the carrier is the ultimate deployment bag. Dual, full-length zippers use a single pull-tab to offer unrestricted access to a tremendous main compartment. Large enough to hold body armor, tactical vests, a rifle and clothing, the Mojo Bag is ideal for any tactical professional. Eleven external, billowed pockets can be loaded with miscellaneous items and accessories. Designed to offer a customized experience, the rear and side panels employ a complete MOLLE grid to offer secure attachment points for additional holsters, pouches, communication sets and more. Reinforced seams and double stitched stress points offer the strength needed to carry the bag fully-loaded over extended time. A removable backpack style harness allows for comfortable carry over long distances, or opt to use the carry handles or shoulder strap. Had it only a couple months and two zippers have already broken. ©2002-2019 CopsPlus.com: Voodoo Tactical Mojo Load-Out Bag with Backpack Straps FREE SHIPPING!